It's been a long seven weeks for fantasy owners of Boston Bruins defenseman Zdeno Chara, who have had to find other options to fill the void he's left in the lineup. 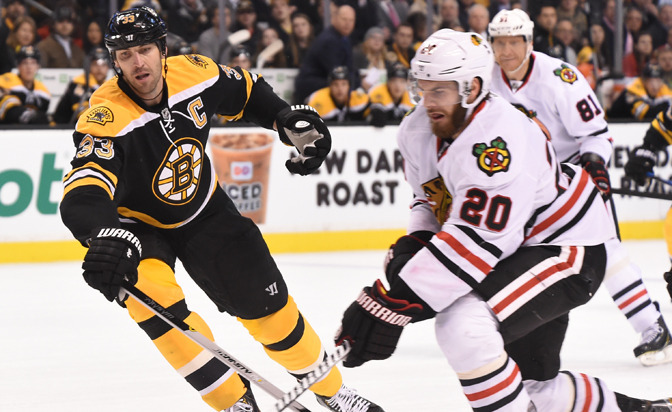 Chara, who hadn't played since Oct. 28 with a knee injury, returned for the Boston Bruins on Thursday and was paired with Dougie Hamilton in a 3-2 loss against the Chicago Blackhawks. Chara logged 24:11 of ice time, two-and-a-half minutes more than his season average. He led all Bruins, except Hamilton (26:22). Chara had one shot on goal and two hits. He also took two minor penalties. Most of his ice time was at even strength, but Chara played 1:50 with the second power-play unit with forwards Seth Griffith, Chris Kelly and Brad Marchand and defenseman Torey Krug. Hamilton was the lone D-man on the top unit. A return to the lineup split the pairing of Hamilton and Dennis Seidenberg, who skated with Kevan Miller. Krug and Zach Trotman remained together. -- Capitals defenseman Mike Green, who missed the past seven games with an upper-body injury, returned and played 2:19 of his 17:58 on a third power-play unit. Green didn't have a point, but had eight shot attempts (three on net, three misses, two blocked) in Washington's 4-3 overtime loss to the Columbus Blue Jackets. Coach Barry Trotz said Green would be eased into action. Green had been averaging more than 21 minutes of ice time this season. -- Goalie Jake Allen made his first start for the St. Louis Blues on Thursday since Dec. 6 when he allowed three goals on 12 shots and was pulled after the first period of an eventual 6-4 win against the New York Islanders. Allen was much better Thursday, making 25 saves on 28 shots in a 6-3 win against the Islanders. It was his first win since Nov. 28. The Blues next play on Saturday, followed by Tuesday, and don't play back-to-back games until Dec. 29-30. It's unclear if coach Ken Hitchcock will stick with Allen to start Saturday or give Martin Brodeur his third start in four games. Brodeur is 2-1-0 with a 2.64 goals-against average and .904 save percentage. -- Chicago Blackhawks forward Patrick Sharp, in his second game since returning from a lower-body injury, again played on the third line with Bryan Bickell and Andrew Shaw in a 3-2 win against the Bruins. Sharp had eight shot attempts, including two on net, and went 1-for-2 on faceoffs. Sharp played 22 shifts and 17:08. He played 17:22 and had an assist in a win against the New Jersey Devils on Tuesday. Sharp played with Patrick Kane, Jonathan Toews, Marian Hossa and Duncan Keith on the Blackhawks' top power play. Toews was injured after getting hit into the boards by Bruins defenseman Dennis Seidenberg midway through the second period. He skated on the ensuing power play and was called for a hooking penalty at 12:53. After serving the penalty, Toews skated to the bench and didn't return for the remainder of the game. Forward Ben Smith replaced Toews on the top line. Blackhawks coach Joel Quenneville said he didn't think the injury was serious. "We'll see how he is tomorrow but it looks like he's going to be all right," Quenneville told the Blackhawks website. -- Forward Joe Colborne skated on the Calgary Flames' top line with Sean Monahan and Paul Byron. Colborne hadn't played since Oct. 28 (upper body). Colborne had an assist but didn't register a shot on goal, but had two hits in 20:09 of ice time in a 4-3 loss to the Buffalo Sabres. -- Mike Fisher, who replaced forward Mike Ribeiro on the Nashville Predators' top power-play unit, had two points. In addition to his first goal of the season, scored with the man-advantage, he had an assist in a 5-1 win against the Arizona Coyotes. Fisher has four points in four games after none in his first three starting his season Nov. 27 after an Achilles injury.